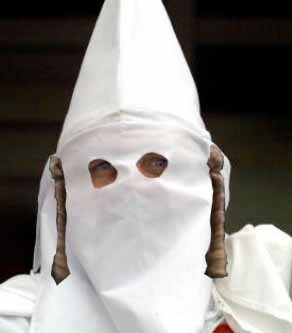 Ku Klux Klan opens its door to Jews, homosexuals and black people. Will JVP follow? The Daily Mail reported yesterday that The Ku Klux Klan opens its door to Jews, homosexuals and black people. The KKK is re-branding as 'the new Klan.' Founder wants Jews, black people, gays and those of Hispanic origin to join. New recruits will have to wear the white robes, masks and conical hats according to founder John Abarr. I am left wondering whether Left Jewish institutions such as JVP, Jews for Boycott of Israeli Goods and Jews for justice may also follow the liberal trend and decide to take Goyim (gentiles) in. I won’t hold my breath.